After years of hearing about cancers, birth defects, lung disease, and other environmentally-linked health problems in poor and minority Los Angeles neighborhoods, the Liberty Hill Foundation took action. 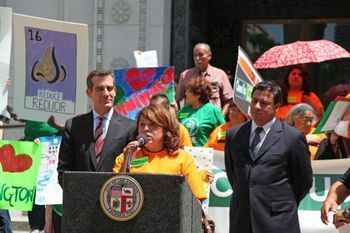 In 1996 Liberty Hill helped found the Los Angeles Collaborative for Environmental Health and Justice. The Collaborative connects academic researchers with organizations from low-income communities and communities of color to study, fund, and support environmental justice work on relationships between toxic exposures and race, income status, and health. Funding partners also include: the California Endowment, California Wellness Foundation, Ford Foundation, Frances Fund, Hewlett Foundation, and Marisla Foundation. Their work revealed critical gaps in information. Publicly collected data was presenting only a partial picture of toxic air pollutants in neighborhoods. The Foundation and its collaborative partners concluded that drawing official data together with local knowledge could help target efforts to make these communities healthier and more vibrant. In 2008, the Collaborative started a “Ground Truthing” project to fill in data gaps on air pollution. They compared regulatory agency data about regional air pollution levels with the environmental exposures and health risks communities were seeing in neighborhoods. Ground Truthing paired data collection and expert researchers with local residents to collect information “on the ground” in six Los Angeles neighborhoods. The Collaborative canvassed neighborhoods and identified air pollution threats, such as high-traffic freeways and roads, rail yards, industrial facilities, and refineries. They also mapped the proximity of those environmental hazards to places where sensitive populations gather, such as senior centers, inhome daycare centers, churches, schools, parks, and medical facilities. Then academic partners evaluated this community-enhanced data using cumulative impacts screening method and statistical analysis. Results revealed toxic “hot spots” that were significantly worse than what the official data indicated: there were many places where sensitive populations and elevated health risks were near polluting facilities and high levels of air pollution. Many sensitive locations had previously not been recognized, as regulatory agencies’ databases had not included churches, senior centers, and similar facilities, leading to higher exposure levels. The project also found more serious neighborhood problems than had been previously documented: many locations recorded in error, more vulnerable populations at risk, significant violations of buffer zones to protect sensitive populations, and air pollution levels that regularly exceeded state standards. Neighborhood-level results have made it easier for advocates to explain toxic exposures’ links to health to state agencies and the media. Through the Collaborative, Liberty Hill is leveraging the community mapping findings to advocate policy changes to reduce, restrict or prevent environmental hazards to health, especially near vulnerable populations. The Foundation is supporting and facilitating a coalition of environmental justice organizations coordinating a Clean Up Green Up campaign, which is assisting small businesses in modernizing their operations and reducing toxic emissions, and creating healthier standards for new industrial development. Liberty Hill also has created a Guide to Green summarizing nearly 50 assistance programs for area businesses. Over 500 guides have been distributed, and a series of informational workshops offered to local businesses in the City of Los Angeles. The California Wellness Foundation shares their story about working with a project that successfully tracks and resolves environmental health hazards in California communities.